I am sore today. Yesterday after dancing like a mad woman through the entire dance DVD twice I collapsed onto the sofa and promptly fell asleep – sitting up. It was all I could do to get myself onto the tennis court a little later and hit a few balls. The exhaustion took its toll and the men soundly beat Charlotte and me – which is not the norm. I’m hoping the fitness levels will improve and we’ll be back on winning form by next week. Today is a Saturday – which I really like because there are no lunch boxes to prepare and there’s a little more time to make breakfast. 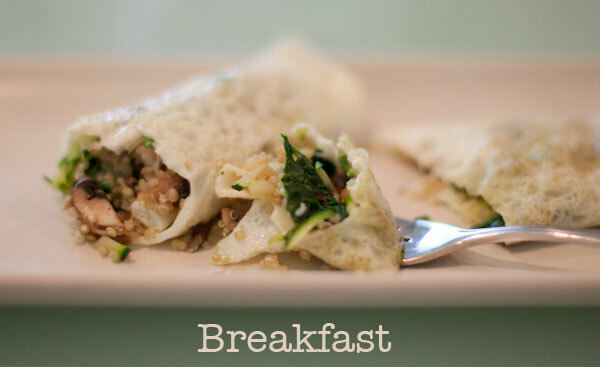 My veggie omelet roll up recipe for day 3 on the 30-day diet plan is an easy one to adapt for the family and super tasty. Prepping all the different parts took a little more time but it was worth it. What I love about following this regime is incorporating lots more vegetables into our diet. I am now whipping up salad for breakfast (turkey inside out rolls) and today a veggie omelet – with one of my favorite ingredients, quinoa. I don’t like the way a lot of these recipes, like this one, call for puréeing the vegetables. I like to bite into things and not have my entire diet consist of baby food. So I didn’t use the blender and instead chopped and steamed everything before rolling it up in the omelet. 1. In a small saucepan over high heat bring ½ cup of water to a boil. Add the quinoa and reduce the heat to a simmer. 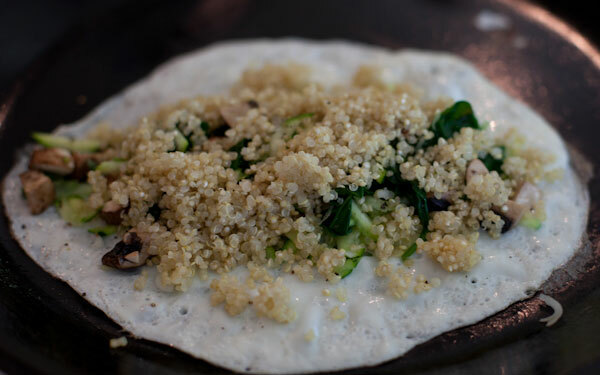 When quinoa is cooked (about 12 minutes) remove from the heat, stir and set aside. 2. Heat a large non-stick pan over medium heat and add 2 egg whites to make a thin omelet. Place 1/4 of the spinach, zucchini, mushrooms, green onion and quinoa on top. 3. 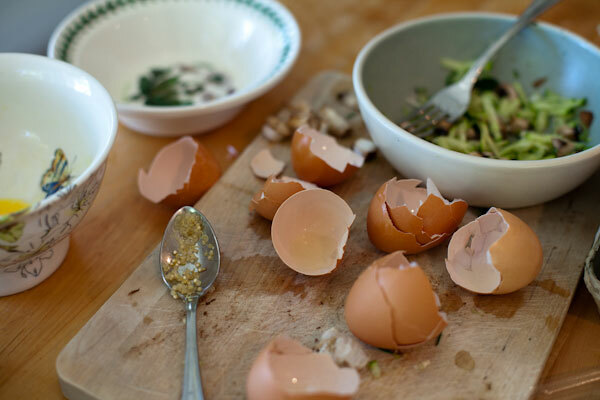 When the egg is cooked (about 2 minutes) fold the two sides in on themselves to create a wrap and serve immediately. 4. Repeat for the remaining 3 omelets – this time using 2 eggs (whites and yolks) for each omelet, lightly beaten before pouring into the pan. The recipe in the book suggests making this dish the night before busy mornings – with puréed vegetables – now that doesn’t sound very appetizing to me – but I’m not here to judge so if you wish to do this go ahead! I invited friends over for lunch, which was going to test my adaptation and will power. No glass of vino for me as we sat outside under the shade of the oak tree. I had asked hubby to move the table out of the bright sun on the deck and into the ‘secret’ garden. It is so perfect. The view is magnificent and to eat outside with friends around a large table is what I have been dreaming about doing in this new outdoor space for years. It finally happened and I was especially pleased to share this inaugural lunch party with special friends. Now I have to remove all the detritus that has gathered in this area and make it look really pretty – it needs a gardening session, which I am motivated to do. I supplemented the salmon salad that the diet calls for with a pasta and mozzarella salad, Lisa’s artichoke and chick pea salad, guacamole and some bread. I stuck to my plate of salad as everyone else tucked in to everything and I think my stomach has already shrunk because I found it hard to finish my plate. 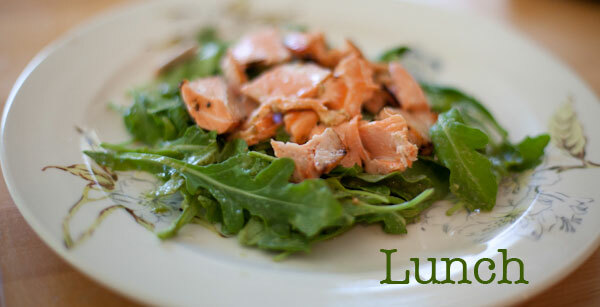 The dressing on this salad is a winner – I like the use of cucumber to add body and flavor. I considered adding some chili pepper but when I tasted it I decided it was good as it was so have the jalapeno waiting to spice up another day. 1. Marinate the salmon steaks in the marin, sake and 3 tablespoons of the lemon juice for about 20 minutes. 2. As the salmon is marinating fire up the outside grill. Use a little olive oil to brush the grill before placing the salmon on top. Grill for about 2 minutes on each side and set aside. Be careful not to overcook the fish – you want moist flakes. 3. Place the 2 remaining tablespoons of lemon juice, the vinegar, cucumber, cilantro and mustard in the blender and purée to make the dressing. 4. In a large mixing bowl pour the dressing over the arugula and toss. Transfer to a large serving platter and arrange the salmon steaks on top. I’m still craving that decadent chocolate pudding from day 1 – but I am sticking with it – snack today was at least sweet and fruity! I think of this as a little like a baby food diet and I know that Tracy Anderson was written up for something similar, today’s snack yet more purée! Does the purée make it easier to digest? Surely the harder my body has to work at chewing and digesting the more calories I am burning. I remember hearing somewhere that crunching on celery uses up more calories than you consume so it’s like a mini exercise. For this I’m tempted to eat a fresh crunchy apple with the blueberries on the side but I go ahead and follow the recipe, this time. 1 medium organic apple quartered, cored. 2. 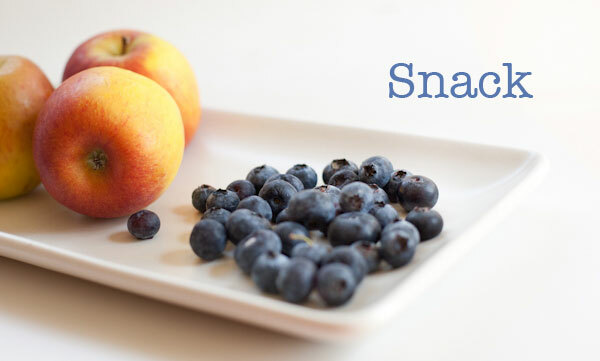 Place the steamed apple and the blueberries in the blender and purée. 3. Serve the applesauce in your prettiest glass. The menu plan calls for a 6 oz orange glazed salmon fillet with roasted mushrooms for dinner on Day 3. I once again chose to go off piste. This was partly because I didn’t want salmon two meals in a row and mainly because hubby and I went out on a date – dinner and a movie. Katsuya followed by Midnight in Paris. 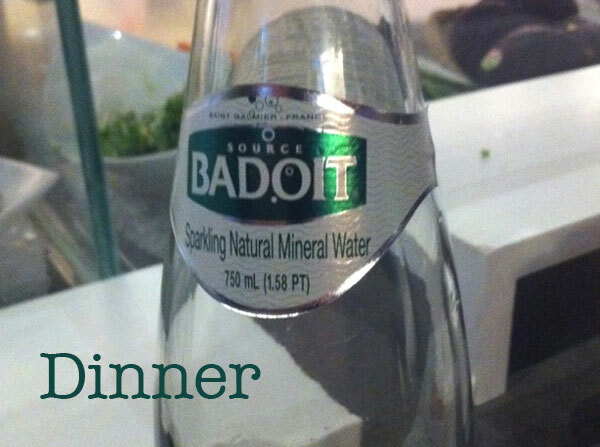 We ordered a bottle of Badoit to share – when in France and all that! I chose wisely. As tempting as the warm baked crab rolls looked and as mouthwatering as hubby’s toro sushi was I stayed away from any rice and filled up on two cups of miso soup, yellowtail sashimi with jalapeno and yuzu dressing and a seaweed salad. At the cinema I wasn’t tempted to get popcorn – but we had come to Glendale rather than the usual Arclight – I just knew I wouldn’t have been able to resist the caramel corn there – my mouth is watering just thinking about it. Dare I say it seemed a little easier – or rather I now know what I have to do. 20 reps each of the muscle toning exercises followed by 2 rounds of the 2 cardio sessions. I managed to dance through all four sets without stopping today and without step touching – this was mostly because I simple enjoyed the music – classic 70s disco blasting out and the sound of the DVD turned down. The kids joined in too. I still can’t dance but I’m learning to follow the moves and it’s good to sweat and jump around. I really don’t feel like I’m drinking enough water. The iced green tea gives me a little buzz from the caffeine but I miss my wine – especially now that I have my outdoor ‘dining room’ in the process of being set up – like eating outside in Provence – just not the same without a cold glass of rosé. But I have resisted, reminding myself of the swimming pool in Provence next to Rosé Corner that is to come. Love quinoa! And love this whole plan. I love how your are documenting all of this, Lucy! I am running out to Barnes and Noble to buy the book. I will beef up my walking and maybe do a little dancing with the kids in the early afternoon – usually the time when I take a snooze! I hope you took before and after photos! x PS your photos are gorgeous and telling your story effortlessly!